CHICAGO — Mayor Rahm Emanuel and several Chicago aldermen want to crack down on the amount of dog poop on lawns across the city. They are proposing a new ordinance that calls on property owners to clean their lots daily to keep them free of feces, or faces fines of $50-$500. The aldermen hope this will help reduce the amount of feces, and reduce the number of rats that feed on the feces. 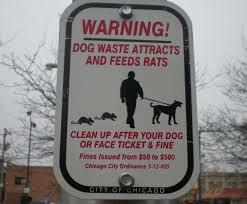 Chicago was named the “rattiest” city in 2013 and 2014 by Orkin pest-control firm.